serve four more years. 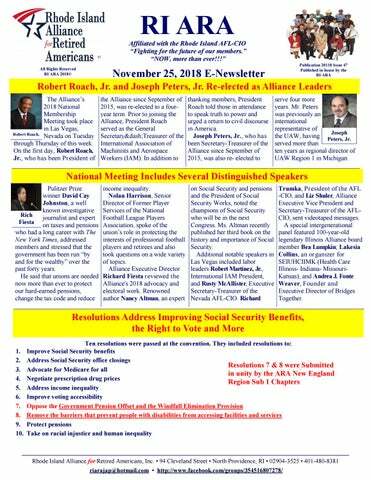 Mr. Peters was previously an international representative of Joseph the UAW, having Peters, Jr. served more than ten years as regional director of UAW Region 1 in Michigan. Trumka, Pr esident of the AFL -CIO, and Liz Shuler, Alliance Executive Vice President and Secretary-Treasurer of the AFLCIO, sent videotaped messages. A special intergenerational panel featured 100-year-old legendary Illinois Alliance board member Bea Lumpkin; Lakesia Collins, an or ganizer for SEIUHCIIMK (Health Care Illinois- Indiana- MissouriKansas); and Andrea J. Fonte Weaver, Founder and Executive Director of Bridges Together. 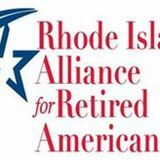 Resolutions Address Improving Social Security Benefits, the Right to Vote and More 1. 2. 3. 4. 5. 6. 7. 8. 9. 10. Lame Duck Session Brings Opportunities to Protect and Strengthen Medicare, Medicaid, and the ACA This week, lawmakers returned to Washington for the “lame duck” session, where they face a variety of issues to resolve before the end of the year. A lame duck session occurs when Congress reconvenes after an election, and is a reference to the outgoing members who still have voting powers. Must-do items over the next few weeks include finalizing outstanding spending bills by December 7 and electing leaders for the next Congress—while movement on matters ranging from criminal justice reform to immigration to tax policy are possible. The lame duck outlook for health care programs is somewhat uncertain, but lawmakers will have several opportunities to protect and strengthen programs for older adults and people with disabilities. In the coming days, we’ll be asking Congress to prioritize Medicare, Medicaid, and the Affordable Care Act in the lame duck session, in part by:  Passing theBeneficiary Enrollment Notification and Eligibility Simplification (BENES) Act (S.1909; H.R. the EMPOWER Care Act, bipartisan legislation that would extend and improve the lapsed MFP Program. Since it launched in 2007, MFP has helped over 88,000 older adults and people with disabilities transition from nursing facilities back to the community. According to independent, national evaluations MFP participants who have transitioned to community-based settings experience significant and lasting improvements in quality of life, and decrease their overall Medicare and Medicaid expenditures by roughly 23%, generating significant cost savings for the programs. What You Can Do As Congress begins the lame duck session, your lawmakers need to hear from you! Call today and tell them to pass the BENES Act, protect the BBA’s donut hole reforms, and extend MFP. Click here to urge your members of Congress to cosponsor the BENES Act and here to ask them to maintain the BBA’s progress. Stay tuned for new advocacy opportunities in the coming weeks! elected officials, member organizations of A Grand Alliance to Save Our Public Postal Service, community supporters and the public to fight plans to sell the public Postal Service to the highest bidder. If the U.S. Postal Service is sold to private corporations, you won’t get your mail every day – maybe only every third day – and you will pay more for mail services. support maintaining a public Postal Service! Fill out the form and an email will be generated to your representative. Thank you for your support of the People’s Post Office!...Read More Click here to Sign up Join our campaign to protect the People’s Post Office and preserve the public Postal Service. Sign up today! The People’s Post Office Keep It. It’s Yours. instead of 2019, giving stakeholders the opportunity to continue to shape the policy. While there is still risk that physicians will have incentives to shorten visits further, the revised payment rates and delayed implementation date represent improvements over the original proposal. We hope our outstanding concerns can be addressed before the new payment structure takes effect, and that the eventual policy appropriately incentivizes providers, protects beneficiaries, and reflects clinical considerations. Read more about our concerns with the proposed rule. Read Medicare Rights’ comments on the proposed rule. Read the final rule. the participants who ate more protein at the study's start were less likely to become disabled than those who ate less protein, the study found. The findings were published recently in the Journal of the American Geriatrics Society. Older adults should eat about 1 gram of protein for every 2.2 pounds of body weight, Mendonca said in a journal news release. That means someone weighing 160 pounds would require about 58 grams of protein a day. A 3.5ounce serving of chicken contains about 31 grams of protein, he said. Good sources of protein include meat, fish, eggs, dairy products, lentils and other beans, nuts, tofu and quinoa. More information The U.S. National Institute on Aging offers healthy eating advice. for the well-being of older persons," Levy said. In previous research, Levy and colleagues found that ageism harms the health of seniors because it can create stress, which affects many types of health outcomes. More information The World Health Organization has more on ageism. stress.  Do breathing exercises. They can give you the same calming benefits as smoking without those toxins.  Seek support. It’s important when dealing with temptations to smoke, withdrawals and cravings. Support could be in a quitline, a support group, a friend or your family.  Reward yourself when you are smoke-free for 24 hours, one week or every month. When you hit a milestone, celebrate. CDC offers smokers free resources and help with quitting smoking. You can call 1800QUIT-NOW or visit cdc.gov/tips. number of deaths attributable to alcohol increased 35 percent, according to a new analysis by the Institute for Health Metrics and Evaluation at the University of Washington. The death rate rose 24 percent. One alarming statistic: Deaths among women rose 67 percent. Women once drank far less than men, and their more moderate drinking helped prevent heart disease, offsetting some of the harm. Deaths among men rose 29 percent. in a day or two, she says. So why do some people feel sick after the flu shot while others don’t? Doctors say reactions to the flu vaccine differ from person to person and that multiple factors are likely at play. Think about how people respond to the common cold. Some folks get a runny nose and go on with their lives, while others stay home with a fever, and still others develop a cough. It’s the same with the flu shot, says Claudia Vicetti, MD, a pediatric infectious disease specialist with UnityPoint Health in Cedar Falls, Iowa. “You’re stimulating your body, and your immune system may react in different ways,” she says. Here’s how your body may react after the flu shot, when you should and shouldn’t worry, and how to feel better once side effects hit. Cancer centers called out for misleading ads Some of the country's biggest and most prestigious cancer treatment centers are using misleading testimonials that don't disclose their results aren't typical, according to a watchdog report. Out of 48 cancer centers, 90 percent used "deceptively promoting atypical patient testimonials," according to the report, "Deceptive Marketing of Hope," published last month by Truth In Advertising (TINA.org), a nonprofit consumer group. The report included high-profile cancer treatment names such as MD Anderson in Houston, Memorial Sloan Kettering in New York, Dana-Farber in Boston, and Moffitt in Tampa, Florida. It also called out Cancer Treatment Centers of America (CTCA), a for-profit hospital headquartered in Boca Raton, Florida, that is the top-spender on cancer center advertising and marketing, according to Kantar Media.